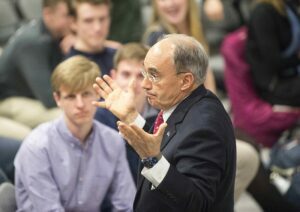 WATERVILLE — Former U.S. Rep. Bruce Poliquin called ranked-choice voting a “complete scam” puppeteered by out-of-state influences, speaking Tuesday evening in front of a Colby College audience. 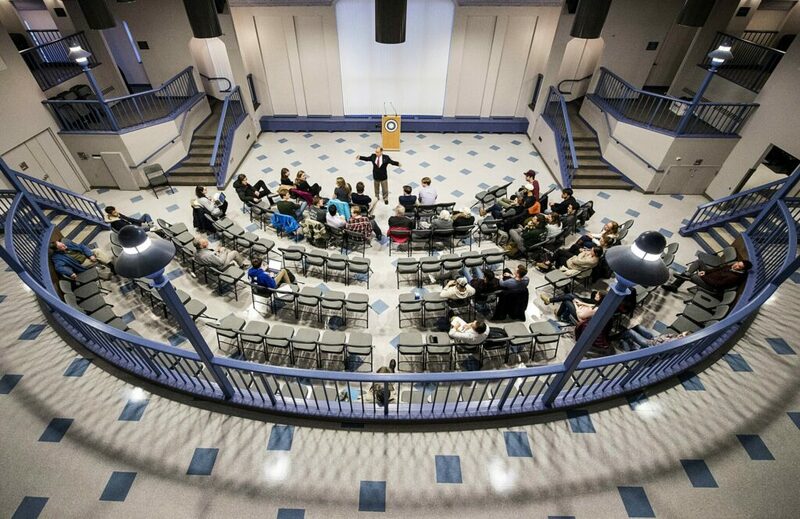 He shared his perspective on the process at a talk sponsored by Colby Republicans, a student organization. “It’s no longer the best candidate; it’s how you game the system,” he said. “You have more of a decision who gets seated in Congress even though you voted for people who are least representative of the district,” he said. Poliquin, a Republican, was defeated by Democratic Rep. Jared Golden in November’s midterm elections, the first race in the nation that used ranked-choice voting to decide the victor in a congressional race. In the first tally, Poliquin received 131,631 votes and Golden received 128,999. When no candidate had secured a majority of votes, 23,013 votes for the independent candidates were redistributed and Golden was handed the win by a 2,905-vote margin. Poliquin, who had held Maine’s 2nd District seat since 2014, challenged the outcome in the U.S. District Court, claiming the process was unconstitutional and requesting a runoff election against Golden. His argument, which was grounded in the idea that the nation’s Constitution requires the congressional candidate with the greatest number of votes to be declared the winner, was rejected by U.S. District Court Judge Lance Walker. Poliquin ceded the race on Christmas Eve. “In any other state in the country, I won — it’s over,” he said. 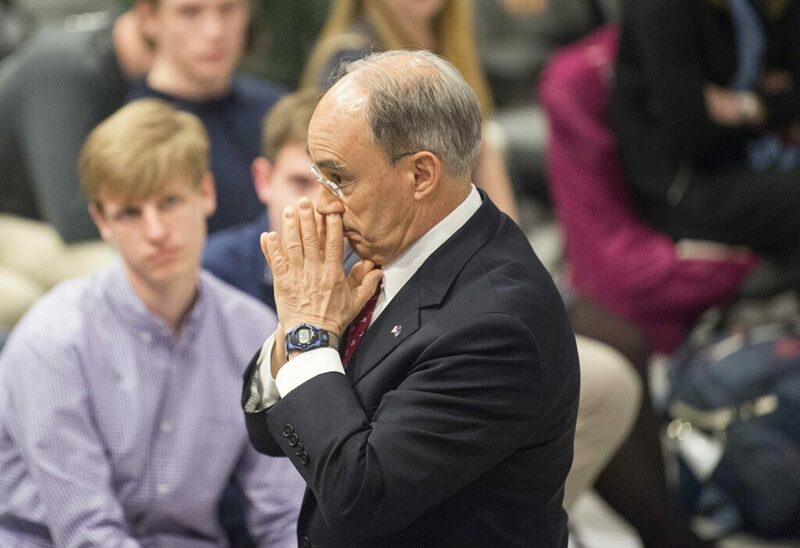 Poliquin stated that he would have preferred a runoff election, in which the top two candidates are known to voters before they cast their ballots. At another point, though, he acknowledged that independent candidates Tiffany Bond and Will Hoar “made it very clear publicly” before the Nov. 6 election that they “knew they weren’t going to win.” In Maine, ranked-choice voting governs state primaries and federal races. 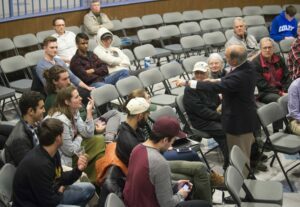 On Tuesday at Colby, Poliquin told a crowd of roughly 30 students and community members that John Arnold, a Texas billionaire, “funded a lot of initiatives, paid people to collect the signatures (to get ranked-choice voting on the ballot) and put the ads on.” He emphasized that in 2016, when Maine voters approved ranked-choice voting, 26 percent of registered voters cast ballots on the referendum. The Committee for Ranked Choice Voting in Maine, which currently has 40 Republican endorsements on its website, lobbied for ranked-choice voting since at least 2015. 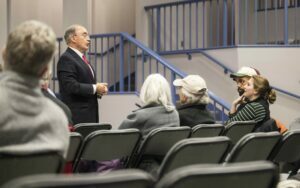 Though he said he did not have specific plans to challenge ranked-choice voting in the future, Poliquin said he thinks efforts to reverse the voting method in Maine are not over. 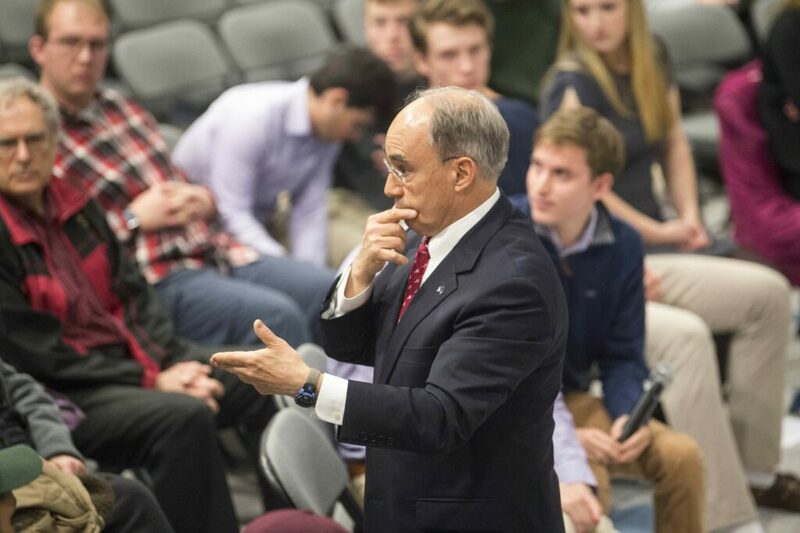 At Tuesday’s event, Poliquin addressed the issue of college students voting in local elections. No requirement of a Maine driver’s license is listed in the state laws for voter registration, though individuals with out-of-state driver’s licenses are required to get a new Maine license and register their motor vehicle in Maine within 30 days of becoming a resident. Voter legislation requires a person to have established an address in a Maine municipality as a “fixed and principal home to which the person, whenever temporarily absent, intends to return.” To determine whether a person meets these criteria, a registrar of voters can use documents that include a Maine driver’s license but also include a Maine motor vehicle registration, current income tax return, mail sent to a residential address, hunting or fishing licenses or “any other objective facts tending to indicate a person’s place of residence.” It states that “the registrar need not find all of these factors to be present in order to conclude that an applicant qualifies to register to vote in the municipality.” The state law does specify that post office boxes cannot be used as proof of residency. To obtain a Maine driver’s license, a person must pay for an examination and for license fees, which range from $21 to $34, depending on the category. Drivers looking to convert a license from out of state pay an additional application fee. Excise taxes are collected on motor vehicle registrations, not driver’s licenses. Several members of the Colby Republicans said they did not think students should vote in local elections. “I think our position as a club is we would like it if students didn’t vote in local elections if it’s not where they live when they’re not in school, because they’re not affected at all by the outcome of the vote,” said Ellie Harlan, a sophomore from Massachusetts who is the secretary of Colby Republicans. First-year student Ewan Frick, who is from Kansas City and not affiliated with the Republicans, disagreed. Students’ voter registrations became contentious in Waterville’s November election when the disputed votes of several Colby students flipped the result of a ballot measure about banning distribution of plastic bags at large retail stores. In the initial vote, the ban passed. But 75 votes, primarily from Colby students, continue to be disputed because the students had listed a post office box on Mayflower Hill rather than a physical address on their voter registrations. The Colby dormitory building at 150 Main St., which houses 200 students, is in a ward and legislative district that are different from the ones where the campus is.